Gum Disease Dentist in Pine Bluff, AR. Gum Disease is preventable and treatable, however understanding the risks associated with it is important to maintaining proper dental health. There are two types of gum disease; gingivitis and periodontis. Gingivitis normally precedes periodontis, however in some cases the gingivitis does not turn to periodontis. In gingivitis, bacteria in plaque build up, which in return causes gums to become inflamed and easily bleed with brushing your teeth. In this stage, no tissue damage or irreversible bone has occurred. In the gum disease periodontis, the inner layer of the gum and bone pull from the tooth and it’s form pockets. These pockets begin to collect debris and bacteria which can become infected. There are many causes of gum disease, however the most common are hormonal changes, illnesses, medications, bad habits, poor oral hygiene habits and family history of dental disease. When caring for you oral health, it is important to remember the factors of gum disease and how it can be easily prevented. 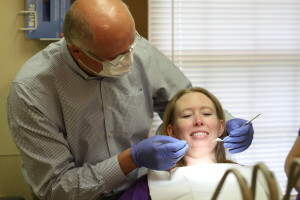 If you need a gum disease dentist in Pine Bluff, AR, call Dr. Mike Clark today.